The 42-mile trail traverses through Hillsborough, Pasco, and Hernando Counties, and was the first to be designed and constructed by the Florida Turnpike Authority. It allows for safe, convenient recreational opportunities while providing for conservation of native landscape buffers. The trail also provides recreation for people who enjoy activities like biking and wildlife observation. Projecting 42 miles northward out of metro-Tampa, through the pastures of Pasco County and into the rolling hills of Hernando County, the Suncoast Trail enables non-motorized access to the region's natural habitat and public places, while also providing for alternative modes of travel for local trip-making. Averaging 1,400 users per week, the Suncoast Trail is widely depended upon as a means for fitness for Tampa Bay area residents and casual nature seekers from northern Hillsborough, Pasco, and Hernando Counties. The Trail passes alongside 10 miles of conservation area and spans two rivers in Pasco County and includes two wildlife crossings in Hernando County. The Trail is also convenient to the students of five public schools within two school systems, and a trail spur is provided to a Florida Sheriff's Youth Ranch in Pasco County. Incorporating eight major trailheads and interconnecting four public parks, the Suncoast Trail increases access to the region's recreational facilities, picnicking, ponds, lakes, and rivers, interpretive areas, and primitive camping. 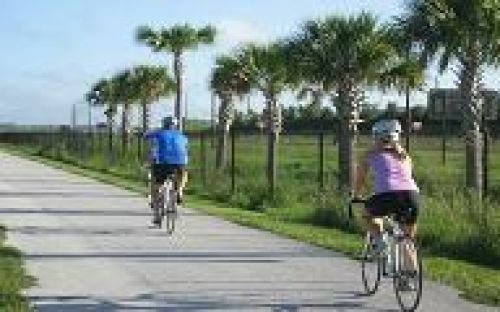 Links to other trails, including the Upper Tampa Bay Trail, Withlacoochee State Trail, Cross Florida Greenway, and others are now being plotted to help open-up statewide connections to natural resources. The Suncoast Trail also provides an important link in the East Coast Greenway's planned connection between the Atlantic and Gulf Coasts. The Suncoast Trail would not have been possible if not for the strong, ongoing partnerships between Hillsborough, Pasco, and Hernando Counties and the Turnpike Enterprise. The mutually supportive relations have brought national and statewide recognition, as seen with the Trail's designation by the White House Millennium Council as a Millennium Trail, the United States Department of the Interior as a National Recreation Trail, and the Florida Department of Environmental Protection as part of its statewide system of greenways and trails. Running generally parallel to the four-lane, limited access Suncoast Parkway, the Suncoast Trail has received national recognition from transportation planning and engineering experts for its contribution to adjacent communities and design innovation. The Trail is considered one of the region's quality intrinsic resources and helps to tell the story of a transportation corridor that is now being considered for designation under Florida's Scenic Highway Program.